"Sweet, salty, and refreshing salad with a little bite." A quick and healthy spinach salad with pomegranate seeds and feta cheese. 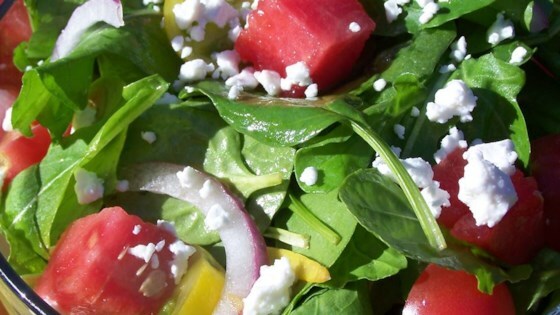 Watermelon is a good addition to the salad, but there was too much onion. 8-8-11: This got a rave from Ann. Delicious! I can't resist adding seeds to most salads...roasted sunflower seeds complement this very nicely. Outstanding salad. Easy to make and everyone loves this salad!! Really good. We added shredded chicken and walnuts and it made a great summer meal.